« Even More Prims – Now on Pumbaa! As announced on our last townhall meeting on November 6th, 2016, everyone has now a 33% higher prim allowance on their land, at no additional cost! 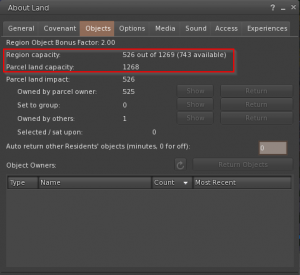 You can check your new prim allowance by opening your About Land menu, Objects tab. As said, these prims are provided to you at no additional charge, so just enjoy them for more detailed decoration on your houses or more products at your store! Possible additional prim raise coming soon! You thought that was all of the good news? No, we have more good news coming up soon! In the next weeks, we will evaluate the possibility of purchasing upgrades for our sims, adding even more prims to your parcels, as soon as we receive more information from Linden Lab regarding this topic. These “on-top-of-the-today’s-prim-allowance-raise” prims we will have to charge slightly higher tier fees for, since we will be billed for them by Linden Lab. However, the very cool thing here is for you: Your existing contracts will not be charged extra either! One of our promises given to our customers in the covenant is, that we will never raise your tiers if we are not forced higher fees upon ourselves by Linden Lab. Since that is not the case (we will do the upgrade voluntarily for you), we will not forward these additional fees to you. The slightly higher fees will then only apply to new contracts once we have bought the additional prim upgrade in a few weeks from now. We have started purchasing the 20.000 -> 30.000 Prim upgrades. Please check the page We have the most prims for you for more details! Quality scripts and gadgets. Menu Greeter Group Inviter JVA Pikku No bot versions. Landmark HUD Music Manager Radio Home Security System TeleDiscs Teleporter. Bowling Alley Greedy Greedy, Cards Against Humanity, Hangout.